Home > Football Stories > Penalties!! There was a time when the world of English football was untroubled by penalty shootouts but unfortunately that time was about twenty years ago. The first penalty shootout in a major competition was in 1972 in an Asian Nations Cup match between South Korea and Thailand. The idea was to replace the drawing of lots, which was considered unfair. Many supporters of teams that have lost penalty shootouts (such as England, for example) believe they are unfair too, but at least there is an element of skill. Or lack of it, as the England penalty shootout history shows. England’s first introduction to the penalty shootout was a brutal one, with the German machine dispatching four near-perfect penalties. For West Germany it was their third shootout so they had some experience of the pressures involved. Stuart Pearce, usually deadly from the spot, drove his shot straight down the middle and the German keeper saved with his legs. Then Chris Waddle stepped up and tried to knock out the floodlights. Shilton, at 40 still a great keeper, had only ever saved one penalty for England before. The German keeper, at 23, equally hadn’t saved many penalties at international level, but with the prior experience of the German side, he knew how to take advantage and moved off his line early on three of the five England penalties, without being spotted by the officials. The correct action should have been for the missed or saved penalties to be re-taken. England’s second, and only successful, penalty shootout was at Wembley facing Spain, who had faced two previously, winning the first and losing the second. Crucially, their goalkeeper in 1996 was the same keeper who had been in that second shootout. David Seaman had a good record for penalty stops with Arsenal and had saved a Gary McAllister penalty in the win against Scotland only the week before. Spanish nerves were probably unsettled by their first shot rebounding off the cross-bar, and by the frightening sinew-busting celebratory roar of Stuart Pearce, laying to rest the ghosts of Italia 90, which roused the home crowd to fever pitch. Seaman proved his worth, saving the fourth Spanish spot-kick and England were through. England managed a return to what was to become normal service in the semi-final against Germany four days after the Spanish win. To be fair, all of the penalties, both German and English, were very well taken until Gareth Southgate stepped up and side-footed to the keeper’s left, but he was going for accuracy rather than power and the shot was slightly too close. As a result, the keeper saved and Southgate, not normally a penalty taker at club level, was distraught. He recovered after some months to appear in a Pizza Hut advert with Pearce and Waddle. As this was a friendly, this wasn’t particularly agonised over and Nigel Martyn probably got his place in the World Cup squad by saving the first penalty. The young David Beckham and Michael Owen, just beginning to break through into the England side, were among the successful penalty-takers. With the match itself causing so much agony for England fans, the penalty shootout was just one more injustice. At 2-2 at the beginning of the second half, Beckham had been sent off after a clash with the wily Simeone, and Sol Campbell’s winner ten minutes before the end had been disallowed for some foul that only the ref saw. With no more real action in extra time, penalties initially went well with Seaman saving from Crespo but Ince’s tame follow-up was also saved. At the end of the initial five kicks-per side, the score stood at 4-3 to Argentina, and David Batty, who had never taken a penalty at club level, let alone international level, had his penalty easily saved by the Argentine keeper, who had admittedly taken three (illegal) steps before Batty had even touched the ball. England’s best dead-ball specialist, Beckham, was of course having an early bath. 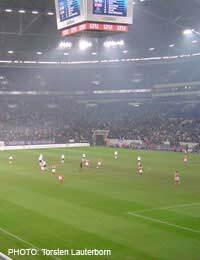 By this time there was an expectation that, with a continental coach on board in the form of Sven-goran Ericsson, a more level-headed approach to penalty shoot-outs would prevail, but this didn’t provide results as Beckham inexplicably skied the first kick, looking ruefully at the turf. Each player then scored, with the exception of the Portuguese Rui Costa, so it was 4:4 at the end of the initial first set of five. In the sudden-death session that followed, Darius Vassell’s kick was saved by Ricardo, who then picked himself up to score himself and win the match for Portugal. The real problem here wasn’t a poor performance at the penalty spot but the insanity of going one-up on 3 minutes only to spend the next 87 minutes defending and hoofing the ball upfield, only to watch it come straight back again. The same nightmare repeated itself two years later at the World Cup in Germany. Portugal missed a number of their kicks, but England missed more, with normally reliable spot-kickers such as Lampard, Gerrard and finally Carragher failing to deliver, only the much-derided Owen Hargreaves converting. Could We Take Penalties Seriously? It is not logical to argue that practising penalties is a waste of time. Any learning professional will argue that practice makes people more comfortable with the task they are to do. If the FA are to be believed, England do now practice, but they obviously have to practice more, and practice unusual situations, like being ordered to take the kick again. This happened to Carragher in 2006 and although he’d put his first kick away, he didn’t know what to do for the re-take and it was saved relatively easily. While the true atmosphere and pressure cannot be reproduced, at least a team that has practiced fully will know who their best takers are and will have a settled order before the match. Too many times England penalty shootouts have been lost because the people with the courage to take them have taken selected over the best shots. The best thing about penalty shootouts is that the matches are not technically won or lost. They are recorded, statistically speaking, as drawn matches, and the side that wins the shootout progresses to the next stage. The team that loses the shootout has not lost the match, it is a draw. This enables the FA to produce statistics to show that Eriksson’s results as a manager were worth the money they paid him.